Welcome to “Nighttime On The Hill. A look at our institutional architecture bathed in warm colorful light. It’s a fact, night images say look here, and we always do. Enjoy! This image is called Political Glow and it sure gets our attention. You should know that night images get more attention every time. I’ve gathered some after dinner images of the buildings on Parliament Hill. 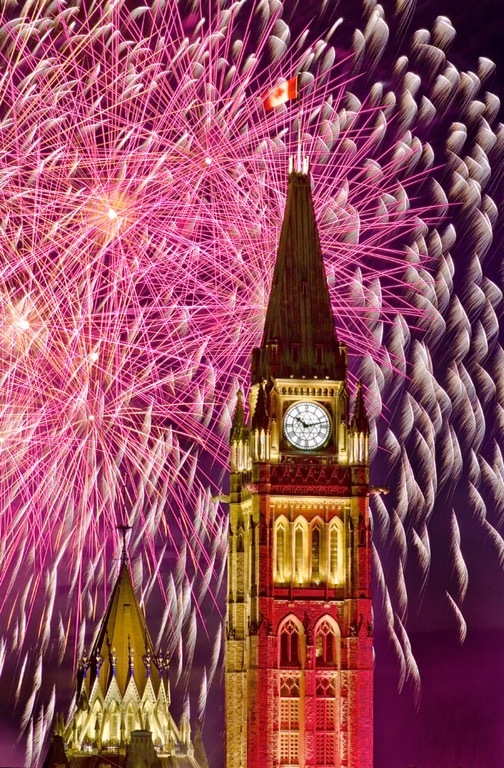 The Peace Tower during the Canada Day Fireworks celebrations on July 1st. I hope you’ve enjoyed this after-dinner look at our stunning institution that is Parliament. 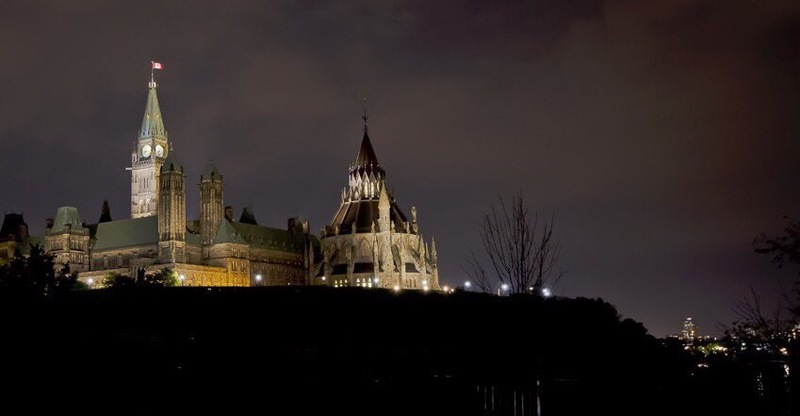 See the 250 Parliament photo collection for more nighttime images. Looking for political or parliamentary photographs? Consider the Canadian Parliament photo collection. 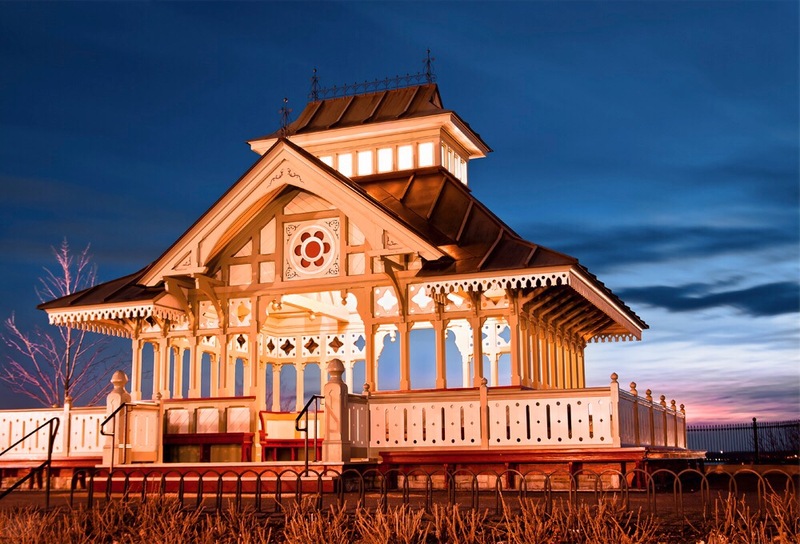 It includes 200+ images of our institution in scenarios such as Canada Day, Inside, Silhouettes, Christmas, Evenings, Seasons and Night shots. 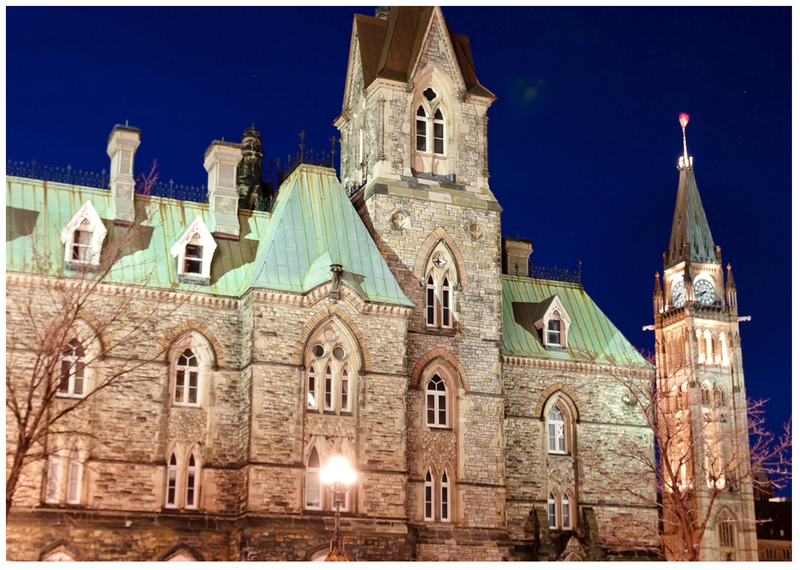 View the Canadian Parliament photo sampler for inspiration! Images start at $12 and are available for immediate download. 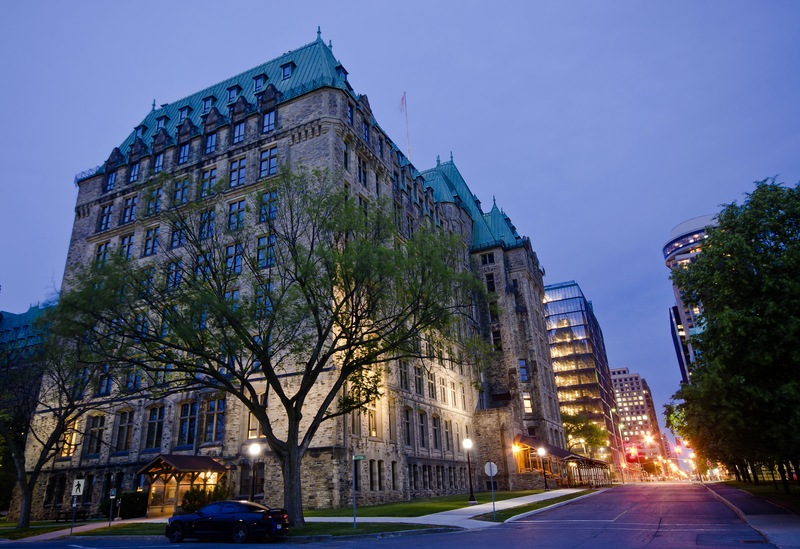 Today, I’m taking you on a visit of the main buildings that make up the Canadian Parliamentary Precinct. They’re based on gothic architecture and have so much to offer and interesting information to read along the way. We’ll see the Library of Parliament, the Confederation building, the East Block, the West Block, the Centre Block and Langevin Block. The Confederation building corner of Wellington and Bank streets. Its interior was renovated in the 1970s to mark a shift from accommodating departmental staff to housing a number of government Ministers and Members of Parliament with their staff. 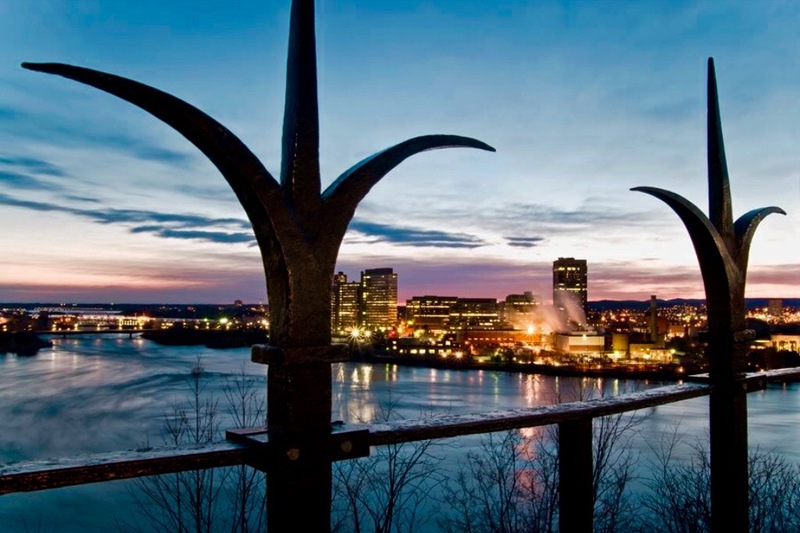 Read the Confederation Building article to know more. The East block, sits on the East side of the Centre Block and mainly houses Parliamentarians and Senators. Find out about this very interesting building in downtown Ottawa just above the Rideau Canal. The interesting part of this structure is that it looks different from the front and the back. The Library of Parliament, also part of the Parliament Precinct, houses all the important documents needed for MPs to do their jobs. It is wonderful with originality and pride. It’s an amazing building set in the High Victorian Gothic Revival style by Thomas Fuller and Chilion Jones. It opened in 1876. Directing a staff of 300, Sonia L’Heureux was appointed Parliamentary Librarian on June 22, 2012. Read the photo essay on this incredible structure. The Library of Parliament was the only building left standing after the fire of 1916 destroyed most of the Centre Block, because an employee remembered to close the iron doors of the Library before leaving on February 3. The West Block of Canada. Sitting just West of Centre block. It houses Ministers, Members of Parliament, their staff, committee rooms, and an important ceremonial space. It is presently being renovated. In 2019, it will be the temporary space for the House of Commons Chamber when the Centre Block closes for renovations. The Langevin Block, corner of Elgin and Wellington streets spanning to Metcalfe street, and takes a whole block in front of Parliament Hill. This building is mainly used for the Prime Minister’s Office (PMO) business. It was the first federal government building to go up after Centre, East and West blocks on Wellington Street. 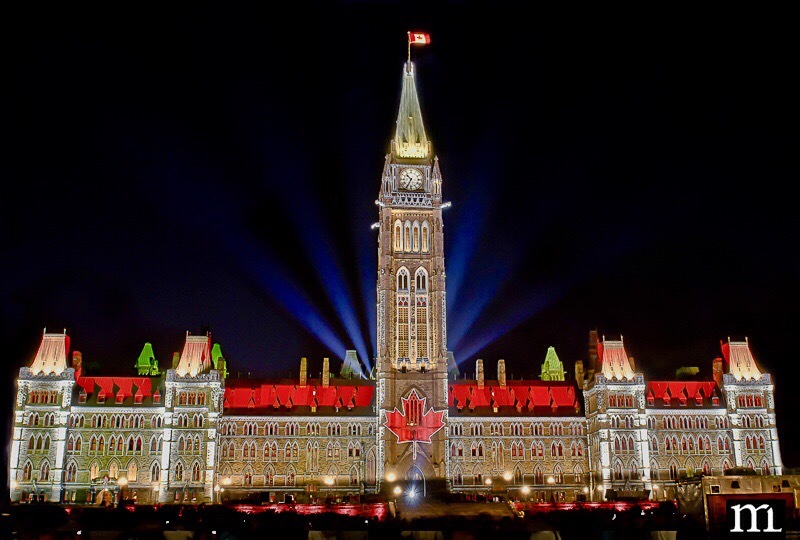 The Centre Block, what most people relate to when thinking of the Canadian Parliament with its 4-sided clock is recognized worldwide and is the number one tourist attraction in Ottawa year-round. It stands proud every day with its gargoyles at the entrance representing England and Scotland. There are tours specifically for schools to help our children better understand the architecture and legislative side of this incredible architectural wonder. Let’s not forget the history that goes behind the Parliament Centre block with all its Prime Ministers, Ministers, Members of Parliament and of course the Pages working to help Members accomplish their daily tasks. 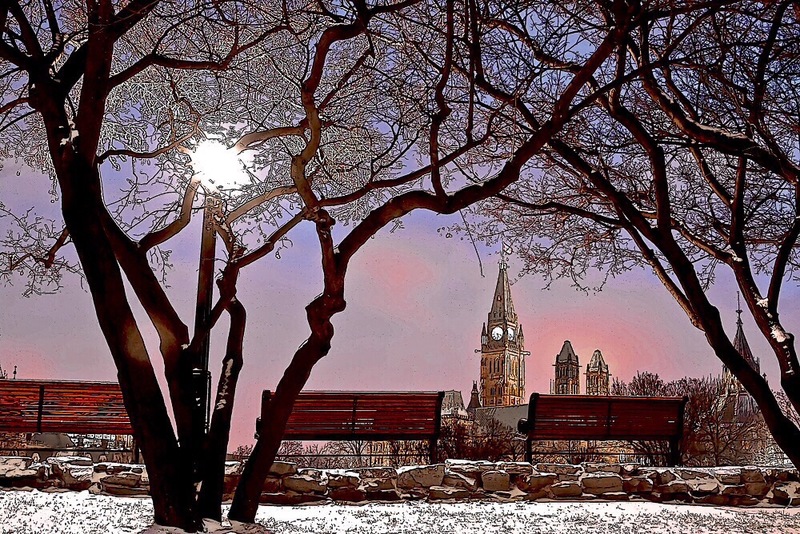 Here, we’ll take you on a seasonal tour of the Canadian Parliament Centre Block. Enjoy! I hope you’ve enjoyed visiting the Parliamentary precinct and all its buildings. The images from these blog articles are from the Canadian Parliament photo collection. 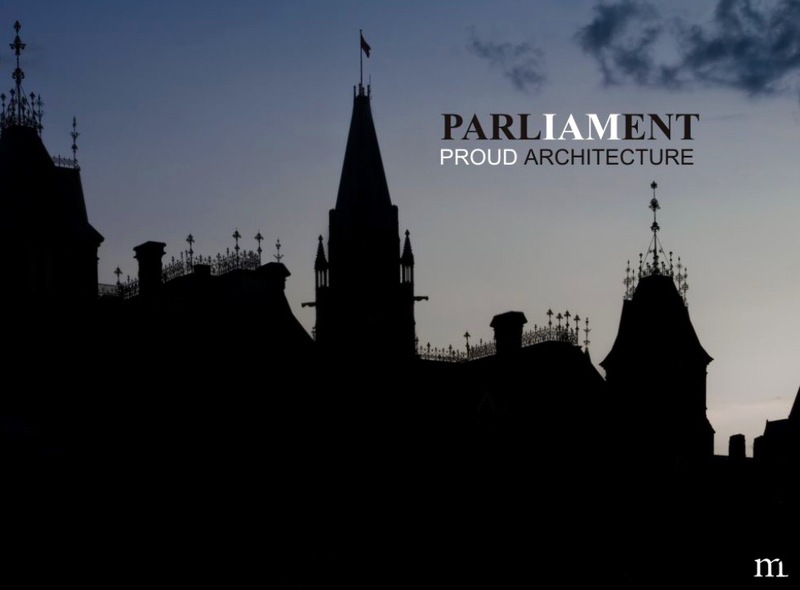 A 200+ collection of our Parliament buildings in scenarios such as Canada Day, inside, evenings, silhouettes, gargoyles, night, seasons, Christmas and much more. Have a look at the collection and I’m sure you’ll find something for your next project. Images start at $5 and are available for immediate download. Thank you for visiting and have an excellent day! Using color images in your documents can be a lot of fun. Color photos can change your mood and make you want to see more of the article or post. Something as simple as balloons can bring back all kinds of feelings and good childhood memories. It’s a fact, photos will get you more views and colourful images get noticed even more. Every time! These feel-good pictures can be purchased from the Colors Collection on Mostphotos.com for as little as $12 and are available for immediate download. Hope you’ve enjoyed your visit. Read the blog and see how this image-maker does it. Thank you and have an excellent evening. Today, I’m taking you on a tour of the Library of Parliament. It’s an amazing building set in the High Victorian Gothic Revival style by Thomas Fuller and Chilion Jones. It opened in 1876. Directing a staff of 300, Sonia L’Heureux was appointed Parliamentary Librarian on June 22, 2012. The Library of Parliament offers information, reference and research services to parliamentarians and their staff, parliamentary committees, associations and delegations, and senior Senate and House of Commons officials. Current issue reviews, backgrounders, compilations, legislative summaries, reading lists and finding aids are just some of the Library’s information tools. The Library has more than 17 linear kilometres of materials (600,000 items) in its collection, including books, periodicals, government documents, CD-ROMs and videos. Parliamentary clients can also tap into services such as on-line databases, an electronic news filtering system and an on-line catalogue of information right from their desktops. The main reading room rises to a vaulted ceiling and the walls and stacks are lined with white pine panelling carved into a variety of textures, flowers, masks, and mythical creatures. In the galleries are displayed the coats of arms of the seven provinces that existed in 1876, as well as that of the Dominion of Canada, and standing directly in the centre of the room is a white marble statue of Queen Victoria, sculpted by Marchall Wood. Not many people are aware that the building is featured on the Canadian ten dollar banknote. The front features a portrait of Canada’s first Prime Minister Sir John A. Macdonald, and a metallic image of the Library of Parliament. A significant portion of the old copper roofing from the Library of Parliament renovation, was reused by the Canadian War Museum at various locations throughout the museum’s interior spaces. The 1916 fire that destroyed the majority of the Centre Block; the building was only connected to the main complex by a single corridor and the library clerk at the time, Michael MacCormac, secured the library’s iron doors before the fire could spread into that area. There is so much more to know and learn about the Library of Parliament. Visit the Library site for an interesting fact sheet and more. The images in this essay are part of the Canadian Parliament photo collection of more than 200 pictures. Images start at $5 and are available for immediate download. I hope you’ve enjoyed the tour. Have an excellent evening. Sources: Wikipedia, Library of Parliament, Royal Canadian Mint. Each December, Capital cities across Canada are brought together by the annual celebration called Christmas Lights Across Canada. 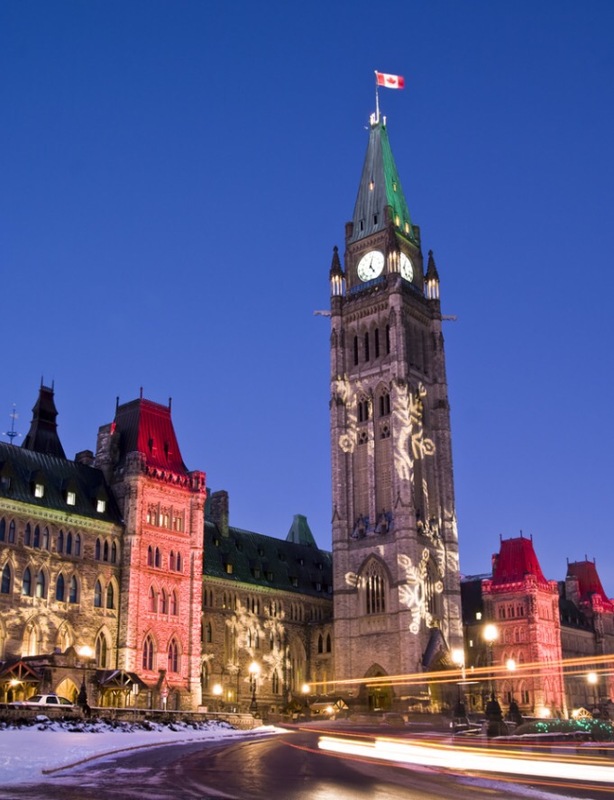 There are giant snowflakes superimposed on the Parliament Centre Block and more than 150,000 lights on the Hill. Here, the trailing lights were a bonus as a bus drove by creating this great effect during a long exposure. Moving inside, we are greeted with a pair of very big Christmas trees in the Rotunda and many more down the hallways. 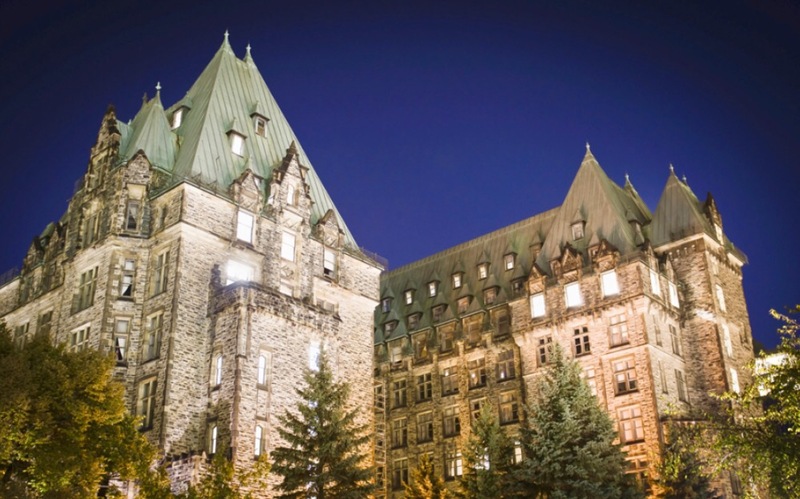 It’s a beautiful showcase that complements the gothic architecture and worth a visit when you’re visiting Ottawa in December. I received this beautiful hand painted ornament of the Centre Block in a gift basket and now it’s part of the Christmas and Parliament photo collections. A view from the Rotunda looking down the Hall of Honour to the Library of Parliament entrance with Christmas trees decorated with red bows. The Canadian Parliament Centre Block in all its decorated glory during the Christmas Lights Across Canada festivities. The Canadian Parliament with giant snowflakes and Christmas trees on the Parliament Hill lawn. 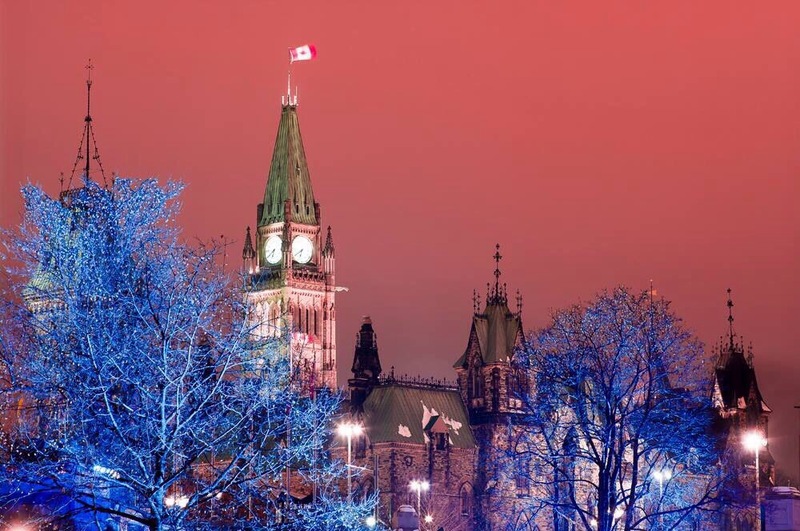 Canadian Parliament Centre Block bathed in a red sky, with blue lights as a beautiful addition during the festive season. This photo was taken from the Rideau Canal; the longest skating rink in Canada. The pictures here are part of the 200+ Canadian Parliament photo collection. Ideal for creative and business professionals, images start at $12 and are available for immediate download. Have a look. You never know! P.S. See the Christmas photo collection and the Christmas Interlude Slideshow for e-Card ideas. Thank you for visiting and have a great evening. The Canadian Parliament buildings are an incredible gothic historic wonder that I’ve been photographing since 2006. The collection is now ready for show and you won’t believe the many angles and perspectives that these buildings offer! 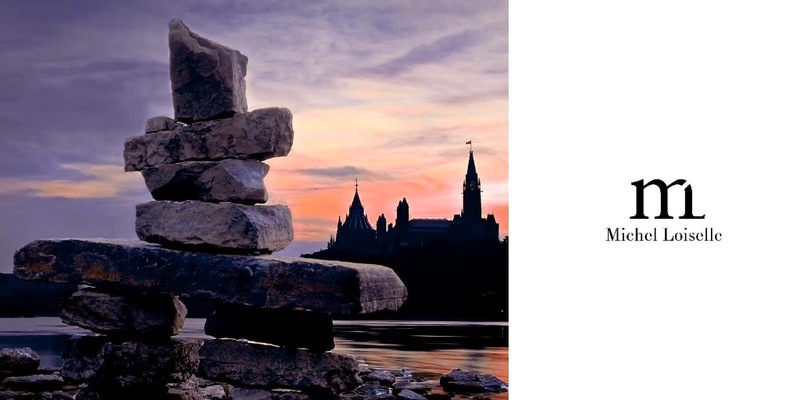 See the many faces of Parliament Hill by reading the “Canadian Pride” pictorial from my blog. You could find the perfect image for your document or report. You never know! Thank you for visiting and have a great evening. A 32-page Parliament Photo Notebook for your creative writings or wild drawings. Features 22 photos.